Bob Zoell has abstracted the appearance and arrangement of typographic design symbols to create a bold and graphic series of ceramic tile murals. 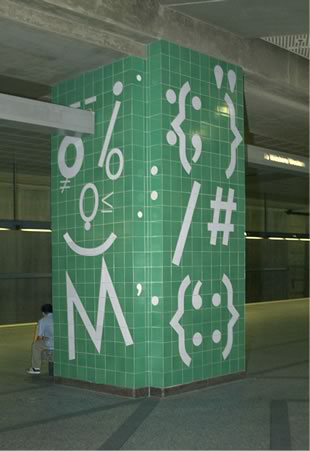 The artwork covers four columns at station platforms: two on the upper level and two in the lower. Each column is approached as a four-sided painting. Zoell favored a palette of citrus yellow, velvety black, crisp white and vivid pea green to deliberately frame his composition of stenciled syllables and symbols. The artist worked carefully to establish an animated and playful dynamic between his characters. Text appears to dance at it’s own happy pace, while other figures run off kilter as if ready to jump off the columns to greet commuters. Both pairs of columns also serve as symbolic gateways announcing the arrival and departure of passengers. 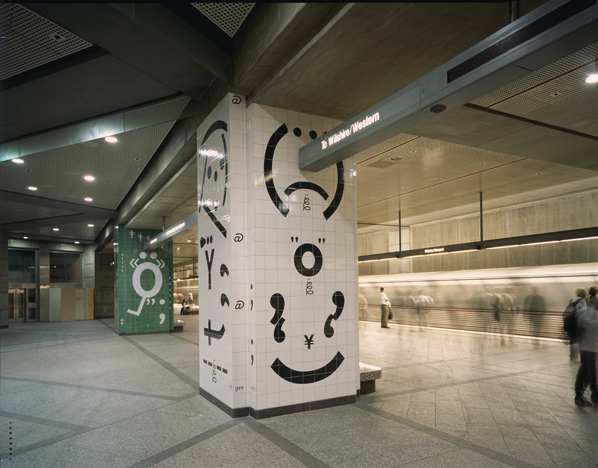 Clown-like faces composed of punctuation marks grin at commuters on the platform entrance sides, while the sides facing the tracks feature a circus of letters “go”-“ing” “by”-by”. Bob Zoell’s artwork has been featured in the New Yorker magazine and he has authored and illustrated many children’s books. He has been included in exhibitions throughout the world including the Fundacio Joan Miro, Barcelona and the Center Georges Pompidou, Paris. His artwork is included in the permanent collection of the Los Angeles Museum of Contemporary Art.